At MDS we realize SUMMER is an awaited time of the year. We spend months and months inside, and or under cold, gray skies which are not inviting to being outdoors. Now that summer is here, would you want your child to be locked inside for 4-5 hours at a Camp? 1. Air- conditioned, naturally sun-lit and beautiful, so being inside feels great in a hot day. 2. Fresh air and outdoor fun should be part of every child's summer experience. Our studio is fortunate to have the perfect set up to enjoy the outdoors as well. Winthrop brand new playground and park: Where we can make use of playground equipment and green space. Ipswich River lightly wooded area: For short hikes as well. Mini Pool & Water Games: We set up in the back patio and water games equipment for some soaking fun. Pool Days: What is better than jumping into a big swimming pool with all your dance friends on a hot day? We have access to one of the nicest swimming pools in Ipswich! 5. Dance, dance dance! 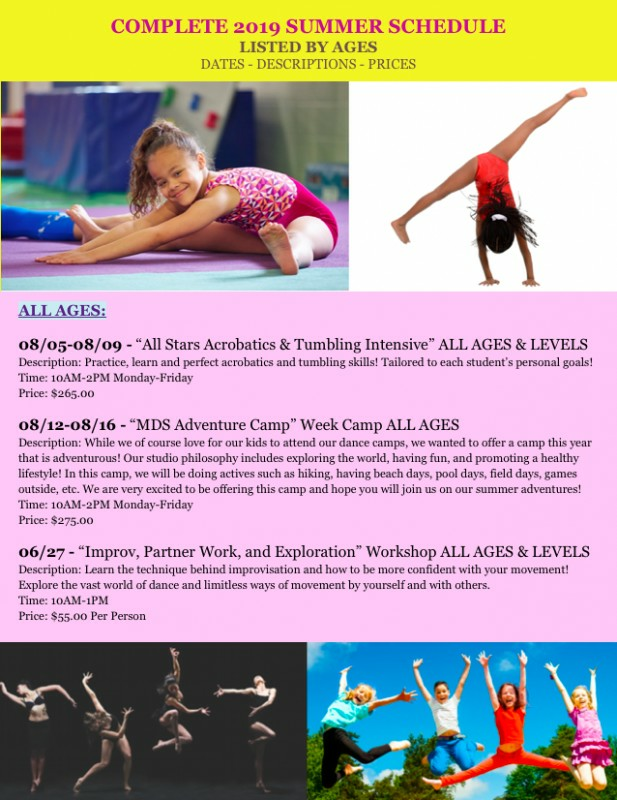 Your child will be exposed to excellent dance instruction in many different styles from Hip Hop to Acro and all in between, depending on which camp you choose..Technique, style, and great music are part of the experience, as well as videoing performances for memory-keeping. 7. Warm, friendly, family feeling. 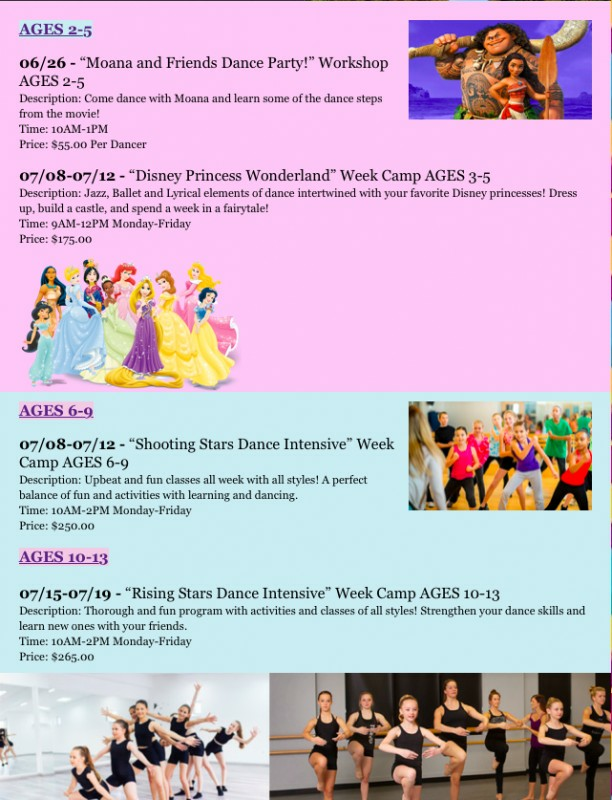 We are famous for our personal touch, and way of connecting with parents and of course, dancers. Our staff members ave a strong technical dance background and experience in most styles of Dance and have been recongnized by National Competition Organizations with Top Score Awards for Choreography, Technical Achievement , Entertainement Factor and more. 8. Safety: your child will be in great hands, watched carefully and guided within a structure that will make for a fun learning, active and socializing experience. 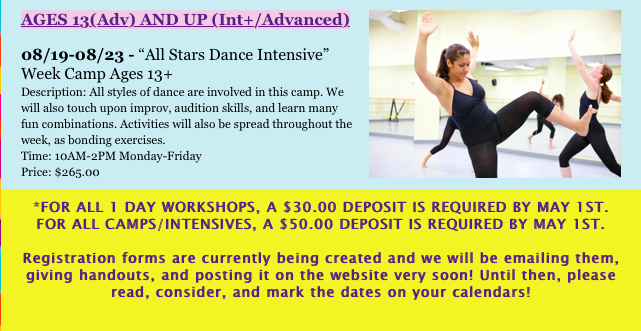 Register for classes by filling out the form below and selecting the class your student wants to attend. A small fee may apply to the days/times in which we are going to the pool/ beach.